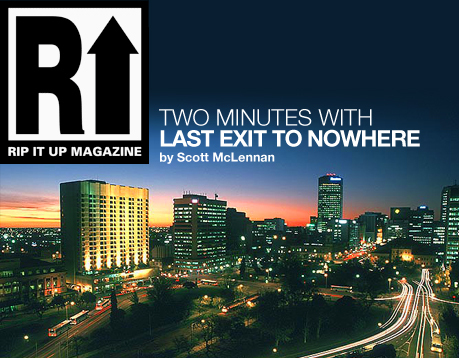 Adelaide’s style magazine Rip It Up contacted us for an interview about the idea behind Last Exit to Nowhere. Here’s a snippet of what was said: “Rip It Up has stumbled upon the greatest film T-shirt company on the web, designed especially for movie fans wanting something that cuts a little bit deeper than simply having a Hollywood star’s grinning mug on your chest. Last Exit To Nowhere specialise in T-shirts and hoodies emblazoned with obscure logo and designs from your favourite cult films, whether they be Fight Club, Aliens or Shaun of the Dead” Rip It Up gets the goss from founder, Mike Ford. Q: How long have you been around for and what spurred you into action? A: Last Exit is an idea I’ve been playing with for about four years. It evolved from an interest in designing band T-shirts, travelling and a love of great films. Q: It looks like you’ve got some cool celebrities donning your gear now – which celebrity would you like to get on board? A: “It’s great having Simon Pegg supporting what we do, also Andrew Stanton (Toy Story/WALL-E) is a big fan. I guess the ultimate would be Barack Obama wearing our Weyland Yutani T-Shirt – now that really would be something!” Continued in Rip It Up Issue 1031, Apr 23 – Apr 29.